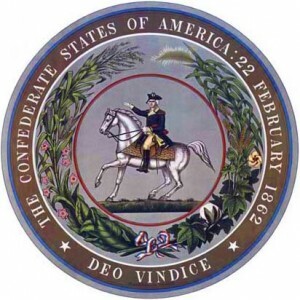 “The Secession-War arose on the issue of whether the Southern states, comprising a unit based on an aristocratic-traditional life-feeling, with an economic basis of muscle-energy, could secede from the union, which had been captured by the Yankee element. The Yankee territory was organized on a financial-industrial basis, with an economic basis of machine-energy . . .
“. . . The anti-financial heroic attitude of the South gave it an immense advantage in the field overt the Yankee armies, who were inoculated with a war propaganda of jealousy of the superior life in the South. The war was a contest — not last in Western history — between quality and quantity. . . .
“This war had many lessons for Europe. . . . It showed the enormous military potentiality in America, it showed the Yankee character, which was thenceforth to be the American spirit, it showed the enormous will-to-power of the New York plutocracy — it showed, in short, that a base for a world-power had been laid here.” — Francis Parker Yockey, Imperium. There is a dichotomy within the Right, and particularly the American Right, regarding the Confederate Sates of America (CSA). When much of the Right was defined by the Ku Klux Klan, segregation, and states’ rights there was a natural tendency to defend the Southern heritage in the name of white supremacy or race purity. There is, of course, still a significant element of opinion within the Right that glorifies the Confederacy, and even outside America there are many who honor the “Stars and Bars” as a flag of “white rebellion” worldwide. There are however other significant factions within the Right who see the Confederacy as a tool of international finance, and in particular of the Rothschilds, and consider Lincoln as the heroic fighter against plutocracy. 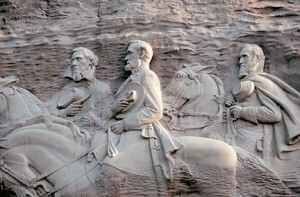 This essay reconsiders the Confederacy with a focus on the CSA’s methods of finance, and contends that the CSA was not only not in the thrall of international finance, but that its banking system was designed to break free of plutocracy in the process of seeking to defend its unique and European traditional way of life. Cherep-Spiridovitch cites an interview with the German chancellor Otto von Bismarck in 1876. Bismarck explained that the Rothschilds who controlled Europe were afraid the United States would become independent of them if it remained one nation. The Illuminati used the Masonic “Knights of the Golden Circle” formed in 1854 by George W. L. Bickley, to spread racial tension by making slavery an issue. Members included Lincoln assassin John Wilkes Booth, Confederate President Jefferson Davis, and his adviser Judah P. Benjamin, the Confederate Secretary of War, a Rothschild agent. The plan was to divide the United Sates between England, controlled by Lionel Rothschild, and France, controlled by James Rothschild. France was to take over the whole South while Canada annexed the defeated North. In 1863 France and Spain invaded Mexico with 30,000 troops. The embattled Confederate States actually offered Louisiana and Texas to France in exchange for assistance. Britain and France were ready to snuff out the young republic but were deterred by Russia, the only European power not in the Rothschild’s thrall. Czar Alexander II sent his fleets to New York and San Francisco and declared that an attack on Lincoln would be an attack on Russia. This passage from Dr Makow succinctly describes the position of many conspiracy theorists and others on the Right in regard to the Confederacy and the American War of Secession. These references to Bismarck should be considered questionable, like the “Hazard Circular,” which is cited just as often by conspiracy theorists but never seems to have a specific reference beyond the statement that it was carried in the London Times in 1865. The CSA’s alleged subservience to Rothschild interests centers around Judah P. Benjamin, the Confederate Secretary of State who is generally termed by friend and foe alike as the “brains of the Confederacy.” That he was Jewish places him beyond the pale of redemption, or at least makes him highly suspect, for many Rightists. However, such knee-jerk anti-Semitism is not helpful in arriving at an objective, accurate opinion about the true position of the South in relation to international finance. There seems little reason to doubt Benjamin’s loyalty to the Confederacy, which should not be read as loyalty to a Rothschild-controlled South. Benjamin became a Senator in 1853 and was noted for his eloquent and sharp-witted defense of Southern interests, becoming a friend of Jefferson Davis that year. Benjamin resigned his Senate seat in 1861 when Louisiana seceded. That year he was appointed by Davis to be the first Attorney General of the Confederacy because of his noted abilities as a lawyer and an orator, and soon after he became Secretary of War and then Secretary of State of the CSA in 1862. With the defeat of the Confederacy, Benjamin fled to Britain but continued to provide generous financial help to friends in the South, particularly the Davis family, during the brutal Reconstruction era. Judah P Benjamin (1811–84) of the law firm of Slidell, Benjamin and Conrad in Louisiana was a Rothschild agent who became Secretary of State for the Confederacy in 1862. His law partner John Slidell (August Belmont’s wife’s uncle) was the Confederate envoy to France. Slidell’s daughter was married to Baron Frederick d’Erlanger in Frankfurt who was related to the Rothschilds and acted on their behalf. Slidell was the representative of the South who borrowed money from the d’Erlangers to finance the Confederacy. Benjamin was raised in an Orthodox family, but his parents rebelled against Orthodoxy and were early members of the Reform movement of Judaism. His mother Rebecca received the ire of Orthodox Jews for her trading on Saturday. Into adulthood Judah attended synagogue on few occasions, although he remained a firm believer in immortality and a personal Divinity. According to his first biographer, Pierce Butler, Benjamin “ceased to hold any active communion with Judaism.” He married a Catholic. Naturally, many would object that like the marranos in Spain, he was attempting to beguile the Southerners. However, Benjamin made no efforts to conceal his Jewish identity, such as by changing his obviously Jewish name — as was the case with the Rothschilds’ Northern agent August Belmont.. It would do just honor to our people. The cavalier or knight is typical of chivalry, bravery, generosity, humanity, and other knightly virtues. Cavalier is synonymous with gentleman in nearly all of the modern languages . . . the word is eminently suggestive of the origin of Southern society as used in contradistinction to Puritan. The Southerners remain what their ancestors were, gentlemen. It is notable that Benjamin emphasized a dichotomy between the North which he identified with Puritanism, and the South, which he identified with the Cavalier — an allusion to the English Civil War where Cromwell’s Puritan victory meant the defeat of the traditional European moral and cultural order of England and the epochal victory of Money. Benjamin hence saw the conflict as one of opposing ethics and cultures and fought as an enemy of those values which are generally regarded as being of “Jewish” inspiration. 1. He was not an especially ethnocentric Jew. In fact, both he and his parents were in rebellion against Orthodox Judaism, and he lived before the rise of political Zionism. 2. There is no reason to be he was a “Rothschild relative.” He was born in humble circumstances in the West Indies. 4. The only personal links between Benjamin and banking interests were tenuously connected through law partner and future Confederate representative Slidell, whose mission in London for the Confederacy failed. 5. Of particular significance, Benjamin recognized the dichotomy between the Puritan ethos and the chivalric-cavalier, identifying the South with the ethos of Old Europe before the Puritan revolts that resulted in the ascendancy of Money. If the British policy of the period was Rothschild policy, then Rothschild policy was not pro-Confederacy. Despite Benjamin’s efforts, diplomatic recognition by Britain was never obtained, and as early as 1863 Benjamin closed the CSA mission to England and evicted the remaining British consular agents from the South. This latter expulsion was at the direct instigation of Benjamin, who called a Cabinet meeting while Davis was en route to Tennessee, an action which nonetheless brought prompt agreement from Davis. Efforts to secure French recognition were also unsuccessful, again in contradiction to the oft-repeated claim that France and England, under the thrall of the Rothschild dynasty, were only deterred from military intervention in favor of the Confederacy because of a threat from the Czar to enter the conflict in support of Lincoln, one primary conspiratorial theory being that the Czar and Lincoln stood together in defiance of the Rothschilds and their Confederate underlings. Indeed, in a breach of supposed British neutrality, by 1863 around 75,000 Irishmen had volunteered to fight with the North, as did Germans and other foreign recruits. Hence, if it is generally concurred that the Rothschild banking dynasty had a decisive influence over Britain and other European states, what is to be made of the willingness of the rulers of those states to allow their citizens to volunteer for the Union army and for Benjamin having personally instigated an end to attempts to foster diplomatic relations with Britain? 1. Neither Britain nor Continental Europe extended diplomatic recognition to the CSA, despite the vigorous efforts of Confederate emissaries. 2. Both Britain and the German states allowed their nationals to volunteer for the Union army, in breach of neutrality. 3. The Confederacy, at the direct instigation of Benjamin, broke off diplomatic efforts with Britain as early as 1863. 1. Francis Parker Yockey, Imperium (California: Noontide Press, 1962), 460–61. 3. Maj. Gen. Count Cherep-Spiridovitch, The Secret World Government (New York: the Anti-Bolshevist Publishing Association, 1926), 180. 4. The “Hazard Circular” is said to have been a document issued in 1862 among bankers and their political dupes in regard to the situation in America. That it has been referenced by reliable researchers such as Gertrude Coogan (Money Creators [Chicago, 1935], 212) makes it no more reliable on that account, but is yet another example of how a myth can take on a life of its own. If however any reader can provide the exact date and page number of the Times in which the Hazard Circular is said to have been published, it would be a valuable document. 6. August Belmont was Rothschild emissary for the Northern states. The claim that Slidell arranged the Erlanger loan is incorrect and will be dealt with below. 8. William Guy Carr, Pawns in the Game (California: Angriff Press, n.d.), 53. 9. Robert Douthat Meade and William C. Davis, Judah P. Benjamin: Confederate Statesman (Louisiana State University Press, 2001), 17. 10. Meade and Davis, 18. 11. Meade and Davis, 285. 12. Robert N. Rosen, The Jewish Confederates (South Carolina: University of South Carolina Press, 2000), 59. 15. Meade and Davis, 270. 20. Meade and Davis, 296.